Have you ever wondered whatever happens to the huge amount of waste material that is dispelled by each household in Guwahati every day? Once the waste is disposed, we hardly stop to think about it, whether it has been disposed in the proper manner and whether it is causing some environmental hazards. In the backdrop of such a scenario, a young artist has come up in the region practicing “waste art”. Now the concept of waste art is not something new. Waste materials or objects of little use in our day to day life and which are hazardous and likely to cause pollution may be transformed into art objects that can even be installed in places of art. When we talk about waste art, we remember artistes like Greek contemporary artist Lucas Samaras who constructed boxes of art with knives, razor, blades and other sharp objects and blended them with delicate and sensuous objects like shells and coloured glasses. We also remember the work of Italian artist Rodia in whose art we find a mixed assemblage of ideas. Nearer home, Manipuri artist Sanajouba Tensuba is one such artist in our midst who is consciousness of the power of waste and how it can be used as an art form to generate a public and art movement. 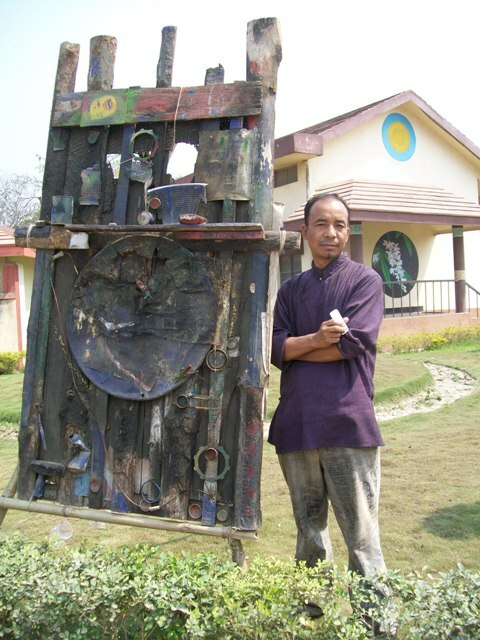 An energetic artist who has manifold contributions in the visual art scene of Manipur, Sanajouba stumbled across the idea of using waste as an art form in his search for a pictorial language to express himself better. He uses waste material of any kind – be it industrial and technical waste material or everyday household objects. He further says, “Since my reactions have an internal dynamics of varied nature, i prefer to work in the mixed media. This style of presentation allows me to translate vibrations, rhythm and gestures into something tangible. I do not see the idea of colour combination as something concrete, but as ways of arresting changes in modes and methods. Hence, I am of the view that red is not only a mere interpreter of danger, but also of beauty. Having won a national scholarship from the Lalit Kala Akademi, Sanjouba’s arts have found their way in private collections in countries like France, Korea, Japan, besides Imphal, Calcutta and New Delhi. He has been honoured with the Manipur State Kala Academy award, Spring festival commendation award by NEZCC at Raj Bhavan in Kohima and the first position award in the All Manipur open painting competition. He has exhibited his art works in solo and group exhibitions all over the country, besides cultural expos and the Guwahati International Trade Fair 2009. The Red Ribbon Superstar Idol contest is a mega music competition organized by the Manipur State Aids Control Society (MSACS) to spread awareness about HIV and AIDS through music. The competition, which targets youths between the age group of 15 to 29 years, has already attained huge popularity amongst the youngsters of the States. This time around, popular band from Imphal West, Cleave, outshone the other bands to win the Red Ribbon Superstar Manipur Idol 2009-10. As part of the campaign, MACS had organized musical concerts at the district level since November last year. The finals saw all the winners and position holders in the district level competitions battle it out for the winners crown of Manipur Idol. As many as 17 bands had participated in the event held at BOAT, Palace Compound. The winner of the contest, Cleave, won the prize money of Rs 50,000, while Exodus from Ukhrul district won the second prize of Rs 20,000. The best vocalist award went to Rubicons of Imphal West and Friends Band. Both of them walked away with Rs 15,000 each. At a time when this dreaded disease has eaten into the very vitals of Northeastern society, it is imperative that more awareness is generated among the people, especially among the younger section who are more vulnerable to this epidemic. Music is a medium that can bind hearts as well as divide barriers. Given the vibrant music scenario of the region, music, if properly used, can be an excellent tool to reach out to the masses, especially the younger generation, and alert them on the danger.